No, this is not some sort of philosophical jaunt through current government threats to cut all funding for the arts and libraries, though goodness knows that could be a college dissertation. Actually, yesterday I realized I was going to be late paying our cable bill and the art history nerd in me suddenly came up with the idea to show you works of art that feature different uses of the word “bill” in the title. Brought to the US as an infant from Ireland, Harnett was apprenticed as a silver engraver for currency as a youth. Obviously, that led to a life of crime (art)! In 1886, New York police grabbed this painting from the bar where it hung and Harnett was arrested for counterfeiting! 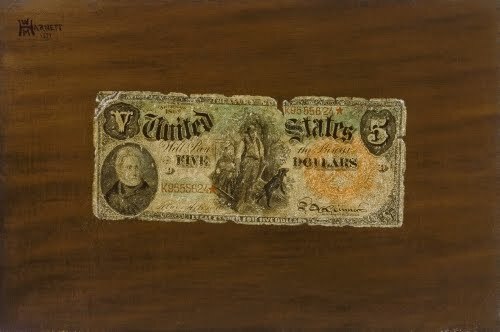 A judge looked at the painting and told Harnett to avoid such “mischief.” Harnett never painted money again, but another trompe l’oeil artist, John Haberle (1856–1933) made it his specialty. I don’t know if he was ever arrested. Harnett turned to painting in 1866, studying at the Pennsylvania Academy of Fine Arts in Philadelphia and the National Academy of Design in New York. In New York, he first began to exhibit still-life paintings. He preferred still life because he could not afford models. Harnett’s preference for still life was reinforced when he went to London and Frankfurt in 1880. He was much impressed by Dutch Baroque still life, which he studied carefully while in Europe. Large sculptures of the hornbill bird (Porpianong) were traditionally commissioned by the Lo and Poro societies of the Senufo as representatives of fertility. 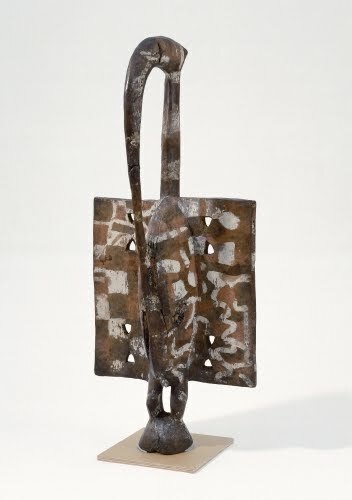 The Porpianong was traditionally considered the “founder” of the Senufo people. Worn traditionally on the head during dance or processions, the sculptures depict the bird’s long bill touching a fertilized stomach, a symbol of procreation. The wings are usually represented as a square with painted designs. Hornbills mate for life and are considered to share in the raising of their young. They protect their young by spreading out their wings. This would probably account for the square, shield-like wings in many Porpianong sculptures. The Senufo people (also called Siena and Sene) are an ethnic group living in Ivory Coast, Mali, and Burkina Faso. Many of them live in the Middle Volta valley, between the Bagoe, Bani, and Mouhoun Rivers in West Africa. Senufo ancestry is not fully known, but they are believed to have migrated northward from the area around Odienne in Ivory Coast. They are now known as distinctly northern, central, and southern Senufo. They have traditionally worshipped ancestors and earth spirits, but many have converted to Islam since the 1700s. I’m not even going to touch on the implications of Cody’s Christ-like “I am coming” statement on this poster. In fact, I’m not touching at all on the questionable ethics of his “Wild West Show.” I’m using his name merely as a vehicle to give praise to a 19th century sensation: the chromolithograph. Chromo—or color—lithography works much on the same principle as multiple block woodcuts, using a litho stone for each color. Alois Senefelder (1771–1834, Czech-German), the developer of the black and white lithograph around 1798, had envisioned color lithography, but never realized it. The first patent taken out on chromolithographs was in 1837 in France. The first chromos were produced in the US in 1840. By the post-Civil War (1860–1865) period in the US, chromolithography had created what some critics called a “chromo civilization.” By the 1880s, when the fad was fading, it was said that 4 out of 6 homes in the West were decorated with chromolithographic copies of either Currier and Ives prints or schlocky genre scenes. The great lithographer Louis Prang (1824–1909) pushed the sale of cheap chromolithograph reproductions of art, because he felt that art was not only for the elite. The Buffalo Bill is a fine example of a chromolithograph in all its glory, right down to the spit coming out of the buffalo’s mouth. I’m wondering if the running buffalo were taken from one of the numerous studies of thundering buffalo executed by George Catlin (1796–1872) in the early 1800s. Regardless of that, the Courier Company was most famous for its posters rather than its reproductions of paintings. 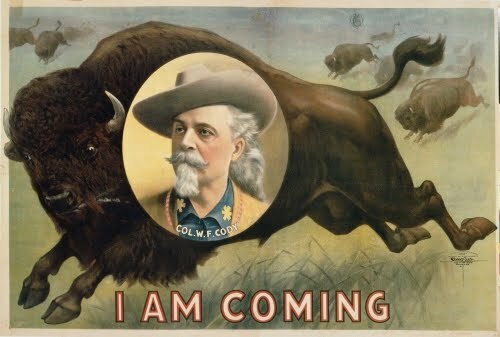 Their most famous posters were done for Buffalo Bill and the Ringling Brothers Circus. It’s interesting that so many of the Russian avant-garde artists warmly embraced Communism as a “salvation” from the country’s imperialist past. 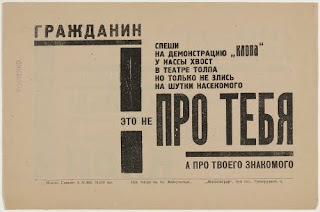 Ironically, this advertisement is for a play (“Klop” is Russian for bedbug) in which Mayakovsky throws shade on the swindlers and new elitists of the Communist party, who ultimately, in the playwright’s mind, become archaic curiosities in the successful Communist dream state of the future. Rodchenko was born to a working-class family in Saint Petersburg, studying art in an academic milieu. Moving to Moscow in 1915, he was immediately drawn to the avant-garde, particularly the Suprematist theories of Kazimir Malevich (1878–1935). Malevich believed that pure abstraction helped elevate and express the spiritual. As an ardent Communist in the coming revolution (1917), Rodchenko turned to the abstract theories of Constructivism, based in geometry and the influence of machines and building. Constructivism advocated for social transformation.